This past week as I traveled to Poland once again to minister and visit a new church that we are working to help start, I got to thinking of how many times I crossed all these borders into Slovakia, Czech Republic and Poland. Even though there are not officials to check my passport anymore as we cross we are still are amazed to see the WELCOME TO SLOVAKIA or WELCOME TO POLAND signs in several languages. My first time to visit Poland was back in1995 while were still living in Moscow and now I have lost track of how many times I have gone to Poland since then. But like so many of these countries I visit so often over here, I am still in awe that we can visit so many countries so easily by living in the centrally located city of Budapest, Hungary. A few weeks ago I saw the sign WELCOME TO MACEDONIA. In December Brenda was in ALBANIA. This week I will be in SERBIA and possibly CROATIA. Someone asked me from America recently, “don’t you ever get tired of traveling?” Without hesitating I truthfully said, “Yes I do.” But then I added that my love for what we do vastly outweighs any kind of “tiredness” I may feel when I do visit these countries. Last week Brenda and I were having lunch with some special Hungarian friends that we have known since we arrived in Hungary back in 1997. We were talking and the subject came up of how much longer we were going to live in Hungary. They were visibly happy and surprised when we told them how much we loved living here and we had no plans of leaving anytime soon. They “loved” that we as Americans “loved” their country. Many times when I visit these countries I visit towns and villages that are small and large, and their names are sometimes hard to pronounce. Try this name in Polish – (Szczebrzeszyn). Even this past week I was in a town called Opole Lubelskie,. But the amazing thing is that in each of these towns we get to work with key leaders to help them start churches. Quite often they are the only protestant/evangelical church in the city. So many times we visit these churches years later and see the lives that are changed. One by one, Person by Person, Family by Family, Town By Town and Country by Country. We are making a difference! So as we look back at these years since 1997 when we first moved here to Budapest and look at all the lives that have been changed, we are so amazed at what God has done in so many lives. So we keep traveling, keep visiting, keep working, keep starting churches to reach people, countries, and leaders here in Eastern Europe. No we don’t HAVE to live here in Budapest, we GET to live here in Hungary and we GET to serve here. We are so, so thankful . . .
SPECIAL FAMILY NEWS . . . We have learned many years ago to set aside time from ministry and do things that we enjoy as a couple. So every once in a while Brenda and I pick places to go to just relax and not talk about ministry and just enjoy time together. This past weekend we did just that. 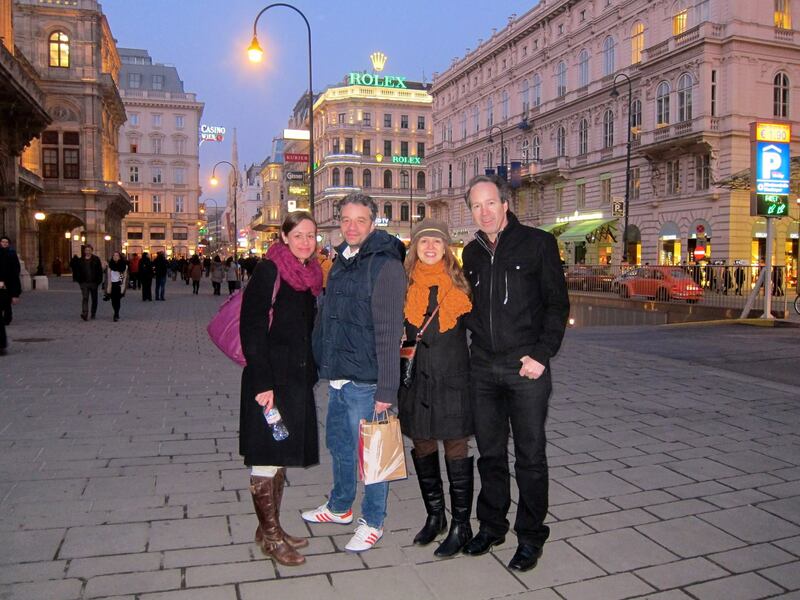 We went with some friends to Vienna, Austria. Vienna is about a 2 ½ hour drive from Budapest. It was so much fun! We went to a typical Austrian Restaurant and had Wiener Schnitzel. It was great and so much fun. 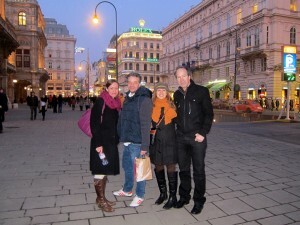 Then we went to local STARBUCKS and our Hungarian friends even bought us a STARBUCKS coffee mug that says VIENNA on it. Taking time away from ministry like this, we are sure, helps us so much to enjoy our time in Hungary. . .
P.S. Maybe you, like us, are amazed at all the countries we are able to reach here in Eastern Europe by living here in the central European City of Budapest. It’s not by “accident” that we moved to Budapest. We believe its part of God’s strategic plan for us to reach this part of the world.